As you know on Xiaomi Mi A1 you will not able to enter to edl mode neither using edl USB Cable nor using the EDL command or options. So the question is how you can enter or boot to edl mode on Mi A1 ? and you are at right place to know and understand the complete process to use edl mode on Xiaomi Mi A1 test point. To use edl mode on this model, you just need to identify the EDL test point on the motherboard of the phone, if you find the correct test point then just connect these 2 points and you are done, and the phone will now detect on your computer. Now you can easily flash the firmware on your Mi phone and also you can remove mi account of the phone. Xiaomi Mi A1 officially locked the bootloader by reasoned to improve the security system. Of course not all devices, only the latest. The impact, we can no longer flash device through fastboot. Another method to flash Nokia phones is through EDL Mode. But there are still many Xiaomi Xiaomi Mi A1 Test Point who do not know how to get a device into EDL Mode, the reason is enter EDL Mode is more complicated than going to Fastboot. Sometimes special tools are needed. What is EDL Mode Mi A1 Test Point ? 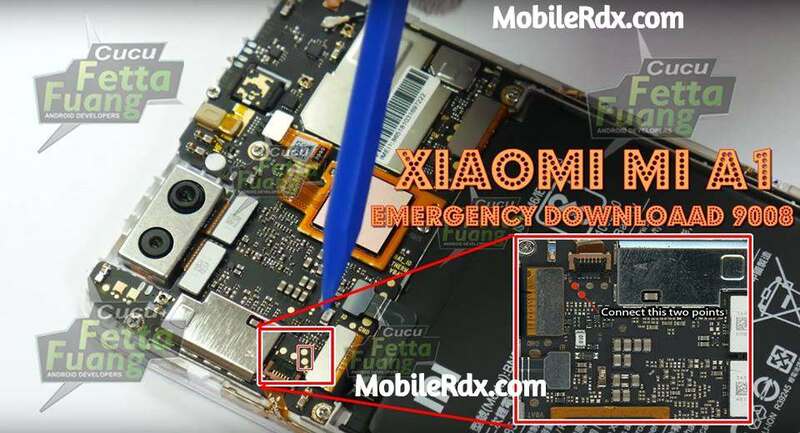 Xiaomi Mi 8 SE Test Point EDL stands for Emergency Download Mode. This mode is like an emergency door to transfer the Android operating system (stock ROM) from computer to EMMC via processor when your device is boot loop, hard brick, or dead boot. The EDL Mode feature is available on Qualcomm Snapdragon devices. Here is the Mi A1 Test Point for flashing remove frp lock and bootloader unlock. Open Back Cover Mi A1 using SIM Used Operator and then use a screwdriver to open the bolt. see above image Xiaomi Mi A1 test point. Connect the other end of the USB cable to the computer and the other end of the USB cable to Xiaomi Mi A1.